Hand me down… – …STILL CRAZY AFTER ALL THESE YEARS! My aunt, since deceased, was very active in the women’s association here and at one time, she and another lady from Kuching represented Sarawak at an international women’s conference held in Manila, Philippines. 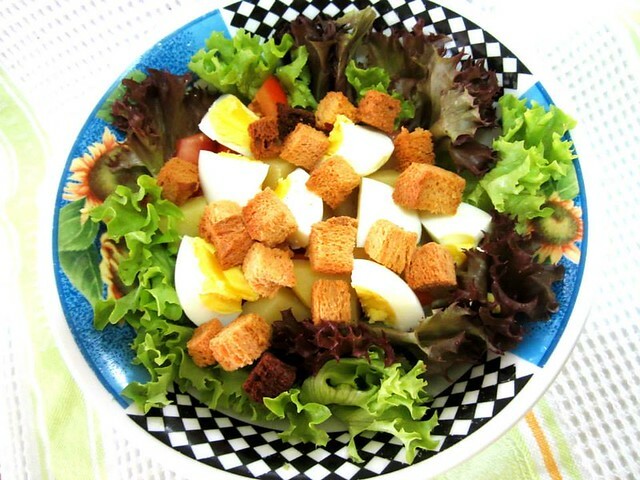 When she came back, at family gatherings, she started serving salads with her very awesome dressing and of course, everyone in the family got her to share the recipe and since then, we would make our own. Oops!!! I did not have any vinegar that day so desperate situations would call for desperate measures and I used calamansi lime juice instead. I think the acidity is needed to sort of “cook” the egg. 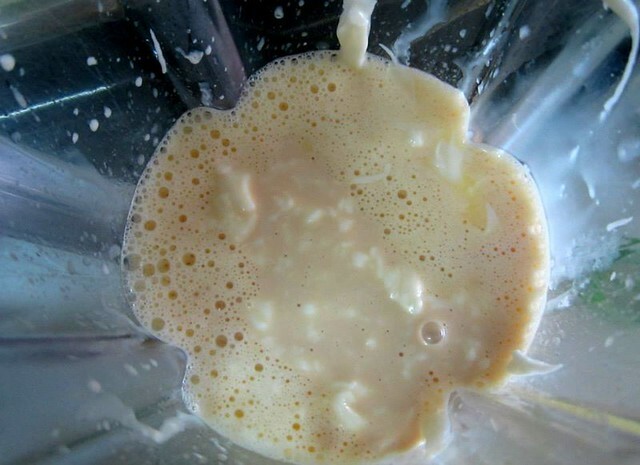 – salad cream, mind you…not mayonnaise and a can of evaporated milk. Normally, I would use Heinz or Delmonte but that day, I could not find any at the shop near my house so I settled for a local brand instead. Pulsate till smooth. We used to have very nice ones here but lately, nobody seems to be making them anymore…leaving me no choice but to use these. I would add more so as to have the peanut fragrance and because these are sweet, there is no need to add any sugar. In the past, we had to add that to balance the sour taste of the vinegar and the salad cream. There you have it! Easy, isn’t it? I remember way back in 1986, I went to Port Dickson with some college mates and we stayed at one of the government chalets there. We had to do our own cooking and I made this salad dressing for the salad. Of course, everyone loved it and they all asked for the recipe. …and mix it all together and eat. Go on, give it a try and let me know what you think of it. For one thing, I can assure you that it is heaps better than just plain mayonnaise. Woah! I like your angle on the first photo! Couldn’t snap from the side, not clear. Your salad recipe is so similar to the Japanese Kewpie Roasted Sesame or Peanut sauce which is available here. As for peanuts, I would buy ready made pounded peanuts widely available here too. If you need them, you can ask your chauffeur to courier over to you la. We have the Japanese kewpie dressing here but limited choices – will see if they’ve any peanut or sesame ones the next time I hit the shops. How inventive to use those peanut sweets in the recipe! Gives it that special fragrance. Oh! I will definitely try this over the weekend. Always on the look out for good salad dressings. That peanut you used was one of my late grandpa’s favourite snacks. I have always loved Heinz salad cream since I was small. It so happens that I have evaporated milk which I bought just because I had a discount coupon from Tesco. Can this dressing be kept for a day or two in the fridge? We usually make a lot – one whole bottle of salad cream and one can of evaporated milk…and use as salad dressing in that particular day. The rest, we keep in the fridge…and eat in the days that follow, ulam style with the leftover cucumber, tomato or lettuce. No problem at all – I guess it can keep a long time – only the egg is raw and the vinegar is supposed to cook it. No worries. You’ll have me for company. Hehehehehe!!!! Yeah, will try out. My kind of recipe, easy peasy and one plus point, all the ingredients are easy available. Nom!!!…nom!! !..Happy eating. Go ahead, give it a try. See how you like it. For one thing, this kacang tumbuk’s not as fragrant as the old school homemade khong therng. Nobody making anymore – I found one very very good one but she also stopped. Would not make even though I wanted to order 100 pieces. Tsk! Tsk! Not crazy about the bottled thousand islands…but I quite like mayo with tomato sauce plus sugar to counter the sour taste – nicer than plain mayo, I feel. I love those kacang tumbuk.. I used to stuff the whole thing in my mouth, it will melt very fast, yes? Can finish the whole packet! Good grief! Ok, still young…but when you get to my age, you’d better watch your sugar intake. Yum yum. I must give it a try. With kacang, any dressing would be nice. It’s nice…but these that we can get from the shops are not so fragrant as far as the peanut is concerned. No choice, lazy to make from scratch. Hehehehehe!!!! Welcome. Come, give it a try, see if you like it or not. With the kacang tumbuk and the sourish taste of the lime, I can imagine this will suit my taste! I seldom take mayo with salad… I normally take unhealthy stuff.. hahaha… very chinesey! Make this for your girl when she comes home. She will surely love you for it! Surprise her! Yes, my girl will definitely love this salad.. her intake of food is so different from the mama here..
You try this. I am sure you will love it too. Different from the usual. I love the croutons too. I never thought of using this method of making salad dressing – the addition of kacang tumbok is the genius bit, that is sweet and will add a lot to the dressing! I must try it out sometime, thanks for sharing! Give it a try. 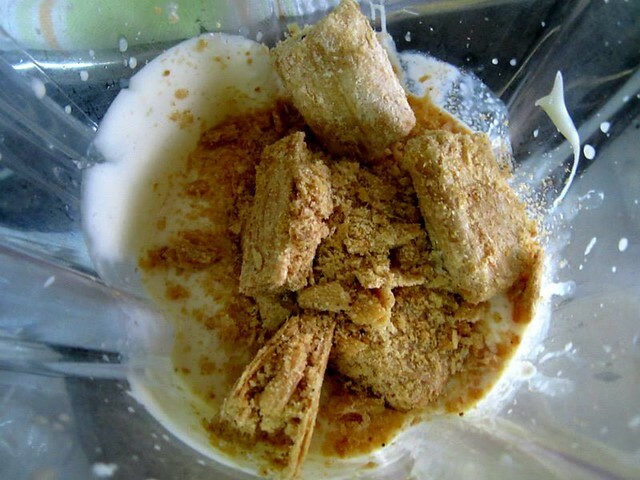 You can use peanut butter instead too but you will have to add some sugar plus peanut butter is thick so it may be harder to pour. 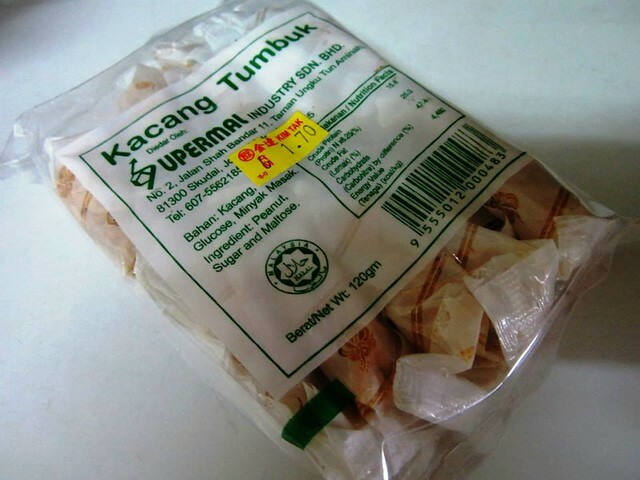 I used to eat lots of this kacang tumbuk when I was small. Such a great idea to incorporate into a salad dressing. Come, this is easy to make. Try it – bet you’d love it! Yes, very resourceful to use kacang tumbuk as a substitute. This dressing should be nice, will give it a try next time. It is. Take my word for it. Everyone loves this at family gatherings – anytime nicer than plain mayo. wow…sound very interesting! Use peanut sweet, I wonder how it taste. What is salad cream? Something like mayo, sold in supermarts in tall bottles like Thousand Islands. 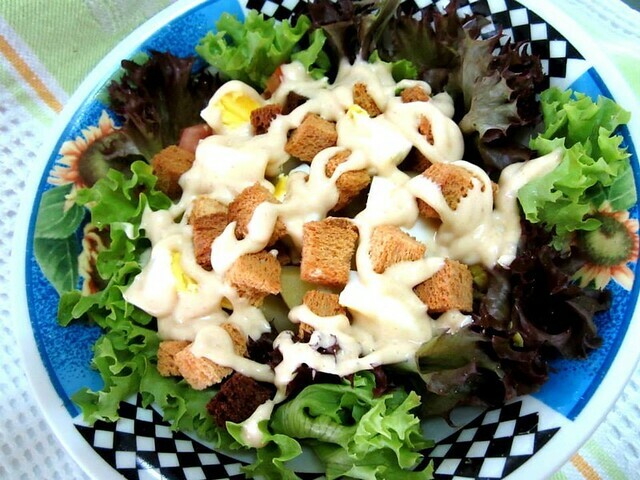 We had that and was using it long before I knew about mayo – those days when salads were unheard of in Sibu. It was such a treat at family dinners – everyone would be looking forward to it. I like this one as it’s simple…and yet very nice – been in the family for years now. LOVED seeing the Salad and dressing! YAY! 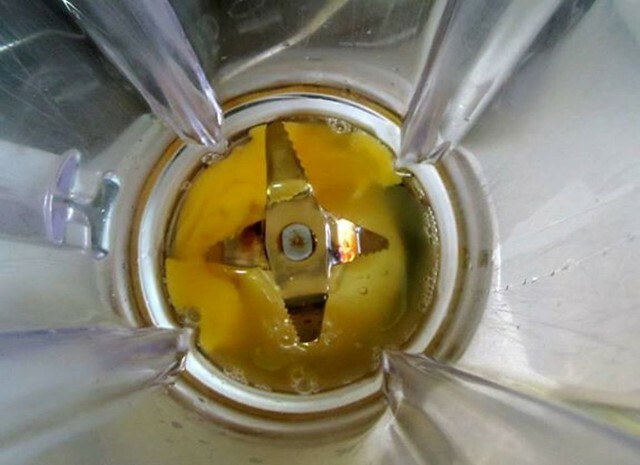 Love Blender photos, too! Great job on the homemade dressing! Something that looks more familiar, eh? I’ve tried others too but this one’s my/our favourite. Not vegan though – there’s egg and milk. So , that’s where you learn your cooking ! Secret revealed ! Lol .. Cooking lies in the family – all my maternal aunties and an uncle too are/were great cooks but I think I learnt more from helping my mum with the chopping and what not in the kitchen. With those factory-made kacang tumbuk? Dream on! Only a very slight hint of the presence of peanut. 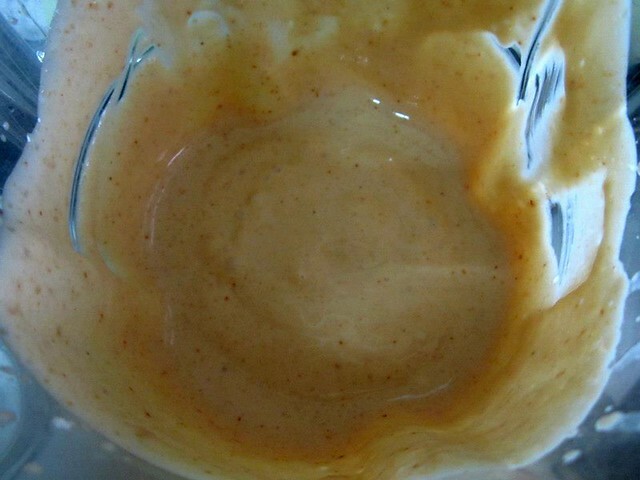 We’ve tried peanut butter instead…but like I told Huai Bin, though it is nice, the dressing gets too thick – makes it difficult to pour. Incidentally, try mixing it with rojak sauce – very nice! Tastes different, but nice – a world of its own. Pingback: Alone again naturally… | ...Still crazy after all these years! Pingback: The right time… | ...Still crazy after all these years! Pingback: Altogether… | ...Still crazy after all these years! Pingback: The other one… | ...Still crazy after all these years! Pingback: Coming… – …STILL CRAZY AFTER ALL THESE YEARS!